After the foundation of the Islamic era in 622, the Islamic empire grew with extraordinary speed. Within a century of its foundation, its territory stretched from Central Asia to the Atlantic coast of Spain - larger than the Roman Empire had ever been. The empire's rulers controlled a huge diversity of peoples and places. Although the empire eventually split into rival dynasties and regions, the widespread use of Arabic helped to maintain a common culture. Arabic was not only the language of the Qur'an but the vehicle for translations and original authorship in all areas of scholarship. 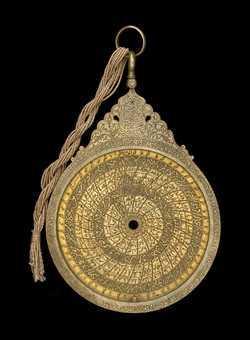 Artefacts also reveal continuities across the Islamic world. Although cities were often renowned for particular manufacturing specialities, the Museum's collection of astrolabes reveals a shared heritage across time and space. While their design details vary, these astronomical instruments demonstrate the combination of mathematical and metalworking skills across a vast geographical area.